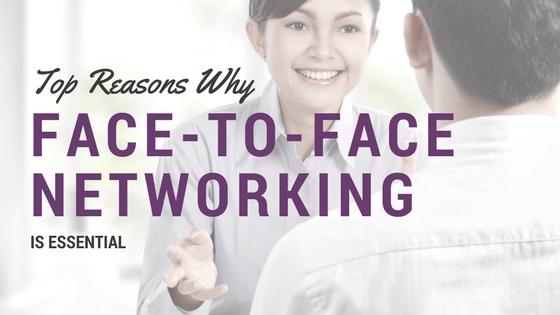 Top Reasons Why Face-to-Face Networking is Essential – The Official Kalix Blog. How many times have you spoken to someone via email and felt a personal disconnect? We live in technologically advanced, social media thriving world, where much of our communication has moved online. While there are many advantages to virtual communication (i.e., email, text message, chat, virtual meetings) including convenience, scalability and the possibility for automation, often times much of this communication is immensely impersonal. As healthcare providers, we understand the importance of developing and maintaining rapport with our clients, this is also true for networking and business relationships. Today we are diving straight in and providing you with the top and most significant reasons why your face-to-face networking is essential now more than ever. 1. Your practice does not exist only online. You have a physical business which means it is mandatory to do some networking face-to-face. This may be for marketing purposes, to obtain clients or interact with other business owners. In person, networking allows you to pick when, where and how to connect with others. 2. It mitigates the danger of “physical disconnection.” One of the problems associated with communicating entirely online is the possible physical disconnection from your customer base. Without seeing you face-to-face, it can be hard for others to see you as an actual person. As a “faceless recipient,” meaningful connections cannot be established or maintained. 3 – Better supports non-verbal communication. Much of our communication is actually non-verbal, i.e., it comes from facial expressions, eye gaze, gestures, and tone of voice. Mood and the underlying meaning of the message can be harder to express and interpret through the written word. 4. Easier rapport building. We create and maintain rapport with someone through the subconscious matching or “Mirroring” of their non-verbal cues. I will not go into detail about Mirroring here, but it is something everyone one does (at least to some degree) subconsciously as part of non-verbal communication. Mirroring helps the listener feel accepted and triggers a sense of recognition and understanding, i.e., rapport. Rapport builds trust and empathy. People are more likely to go out of their way to aid those who they trust, and they will usually want them to succeed. 5. It is the most memorable way to network. People will not just remember what you said, but they will remember your face and the impression you made on them in person. 6. Facilitates the expression of passion and emotion. Conversations in person allow you to be original, authentic and to inspire. 7. You obtain feedback immediately. This is and will always be a plus and is pretty self-explanatory. 8. Message customization. Though immediate and ongoing feedback (verbal and non-verbal) you can customize your message to better suit your audience. 9. Expression of personality. You can show off your personality and brand more in person than through any other way. 10. You can build LASTING connections. When you network face-to-face, you’re able to connect more with people and create a much deeper long-lasting relationship. For suggested channels for networking as a private practice nutrition profession please see our blog post below.